TARASIUS was born at Constantinople about the middle of the eighth century, of a noble family. His mother Eucratia, brought him up in the practice of the most eminent virtues. By his talents and virtue he gained the esteem of all, and was raised to the greatest honors of the empire, being made consul, and afterwards first secretary of state to the Emperor Constantine VI and the Empress Irene, his mother. In the midst of the court, and in its highest honors, Tarasius led a life like that of a religious man. 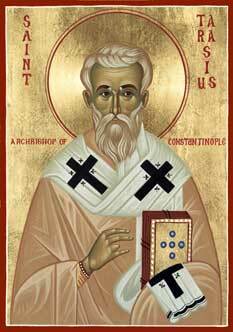 Paul, Patriarch of Constantinople, the third of that name, though he had conformed in some respects to the then, reigning heresy, had several good qualities, and was not only beloved by the people for his charity to the poor, but highly esteemed by the whole court for his great prudence. Touched with remorse, he quitted the patriarchal see, and put on a religious habit in the monastery of Florus in Constantinople. Tarasius was chosen to succeed him by the unanimous consent of the court, clergy, and people. Finding it in vain to oppose his election, he declared that he could not in conscience accept of the government of a see which had been cut off from the Catholic communion, except on condition that a general council should be called to compose the disputes which divided the Church at that time in relation to holy images. This being agreed to, he was solemnly declared patriarch, and consecrated soon after, on Christmas Day, 784. The council was opened on the 1st of August, in the Church of the Apostles at Constantinople in 786; but, being disturbed by the violence of the Iconoclasts, it adjourned, and met again the year following in the Church of St. Sophia at Nice. Having declared the sense of the Church in relation to recognizing to holy pictures and images a relative honor, the council was closed. Synodal letters were sent to all the churches, and in particular to the Pope, who approved the council. The life of this holy patriarch was a model of perfection to his clergy and people. His table contained barely the necessaries of life; he allowed himself very little time for sleep, being always up the first and last in his family. Reading and prayer filled all his leisure hours. The emperor having become enamored of Theodota, a maid of honor to his wife, the Empress Mary, was resolved to divorce the latter. He used all his efforts to gain the patriarch over to his desires, but St. Tarasius resolutely refused to countenance the iniquity. The holy man gave up his soul to God in peace on the 25th of February, 806, after having sat twenty-one years and two months.